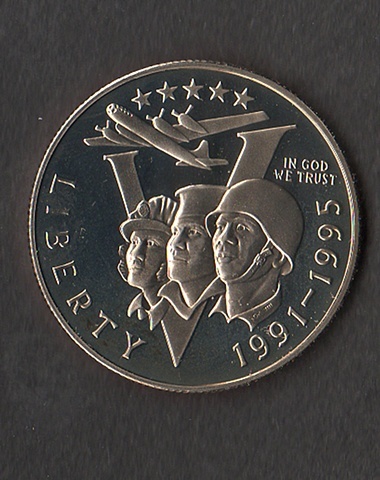 In 1991, my design was chosen for the obverse side of a new half dollar commemorative coin produced from 1991-95, by the United States Mint to honor the fiftieth anniversary World War II, "in accordance with legislation passed by Congress and signed by the President on October 14, 1992." (Image copyrighted by the artist. © George Klauba. All rights reserved.) The design represents three military personnel superimposed on a V for victory with a B-29, the plane ended the war with Japan. The five stars represent the five branches of military service.